I’ve been thinking recently about Fiduciary responsibility and what that has come to mean over the past two decades of rapid growth. I’ve been thinking about how and why the interpretation that has crept into investment culture over that period – simply to maximize rates of return – has slowed an appreciation of investment that doesn’t cause social or environmental harm. It goes without saying that this has also slowed investment that promotes social good as well as generating returns. I’ve also been thinking that by itself this narrow interpretation ignores both business risk and opportunity – neither of which should be ignored considering the dictionary definition of fiduciary duty: to act prudently. Writing in a Capital Institute blog, Stephen Viederman, former president of the US-based Jessie Smith Noyes Foundation, argues that foundations should align program work with investment strategy – something that is all too rare. “Foundation fiduciaries have an obligation to seek ‘good’ and ‘competitive’ returns, not necessarily to maximize them,” he says. Part of the problem has been the accompanying “myth of financial underperformance from ‘social investing,’ a myth that still lies at the heart of the problem for finance committees who conveniently forget that two-thirds of traditional active managers underperform their benchmarks every year,” Viederman says. Indeed, most investors are not considering the business risk associated with investing, for example, in a power company, a textile operation or mining business in a region that is water scarce. Most ignore the reputational risks associated with investing in factories or plants that are polluting, overly consumptive of resources, or engaged in bad labor practices. “All investments are about the future, but most investment decisions are made on retrospective data, which as fund offerings make clear, are not predictors of future earnings,” says Viederman. The ADM Capital Foundation launched a web portal, China Water Risk, in October to provide investors and companies with information about water scarcity and pollution in China. Part of the thesis behind the initiative is that better investment decisions produce better returns in the long run and these usually come with more information – and not the information investors traditionally have sought. But, certainly, few could disagree that the regulatory environment is changing to reflect resource consumption and that water pricing in the near future will reflect scarcity. Few could disagree that NGOs are increasingly sophisticated in exposing pollution incidents (see my blog posts on IPE’s Ma Jun and Apple, on Greenpeace’s Dirty Laundry and other reports) and that local protests in China are growing around pollution incidents. Workers are no longer content to suffer exposure to hazardous chemicals silently, or work extraordinarily long hours without proper compensation. All are, potentially, a drag on profits. Would it not then make sense for fiduciary duty to include analysis of such risk? Fully Risk-Adjusted Returns (FRR), as they might be called, should certainly not be lower as a result, indeed given the current and future challenges the world faces, they could even be enhanced by additional information. For those who missed this, one company that is looking to consider the impact of production is PUMA, which earlier this year announced the results of an unprecedented environmental profit and loss screening. This was a big step toward assigning economic value to resources consumed and to emissions. The value assigned was also a step toward determining the true cost of production of PUMA apparel and shoes. The analysis showed that raw material production accounted for the highest relative impact of Greenhouse Gas Emissions and water consumption within PUMA’s operations and supply chain. 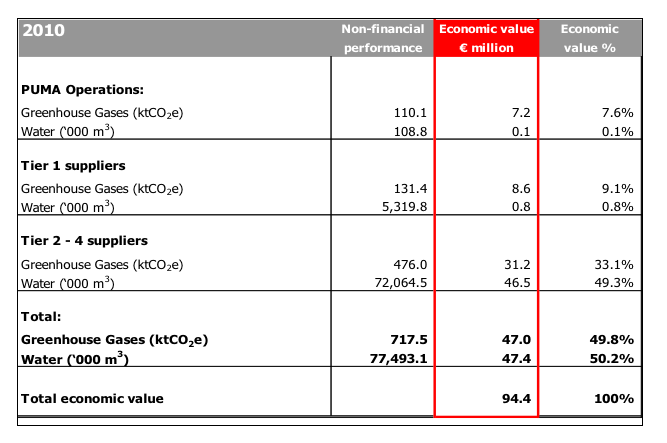 According to PUMA’s report, the direct ecological impact of company operations translated to the equivalent of 7.2 million euros of the overall impact valuation. An additional 87.2 million euros was distributed along the four-tier supply chain. Thus, the overall environmental impact of GHG and water consumption amounted to 94.4 million euros. That compares to a third-quarter net profit of 82 million euros. “By putting a monetary value on the environmental impacts, PUMA is preparing for potential future legislation such as disclosure requirements,” the company said. By focusing exclusively on the creation of financial wealth for individuals are financial markets destroying value for society? Is social responsibility a component of investment that is necessarily detrimental to financial return? Should changes be made in the taxation and supervision of financial transactions to account for financial markets’ responsibility to society? Clearly, business as usual is no longer smart business and change is imminent. Considering the impact of investments and reconsidering how we make investment decisions will be the way forward. Let’s start by redefining fiduciary responsibility, considering Fully Risked Returns. Clearly, returns may actually be enhanced either when viewed through the lens of an appropriate risk framework/weighting or in reality as a result of a superior business environment.